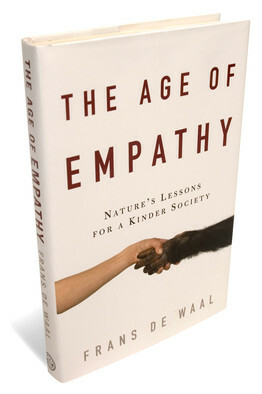 In his latest book, The Age of Empathy: Nature’s Lessons for a Kinder Society, primatologist Frans de Waal argues that social darwinists... have learned the wrong lessons about the natural world. The nasty, brutish existence dominated by “savage competition, ruthless exploitation, and deceit” that Dawkins describes is far from the norm for animals that live in social groups. They thrive because of the cooperation, conciliation, and, above all, the empathy that they display towards fellow members. The support and protection they receive from living in a group more than compensates for any selfish advantage they might have achieved on their own. ... Peony, an elderly chimpanzee who was incapacitated with arthritis, received water from younger females who collected it in their mouths and then spat it into hers. Then there’s the case of a four-year-old chimp that was close to choking after getting a rope wrapped around his neck. The oldest, most dominant male quickly ran over to the struggling youth and lifted him up with one hand before relieving the tension on the rope. These examples seem to defy a natural world where kindness is ultimately self-serving. De Waal speaks brilliantly about his book in the video below, saying of inter-species empathy, "the mechanism is activated by other species" : . And lastly, because so many businesses have modeled themselves with Social Darwinism, it's no surprise who rises to the top to lead those types of operations. The Psychopath Test, featured this past on the popular radio show This American Life, is a must-listen for anyone who wonders why corporations can be so ruthless and morally bankrupt. Because many of the most "successful" are run by psychos.